G model entrance door issues. Door is hard to open from the outside after sitting awhile. If you have ever gone to a G45 sitting on the ready line, after sitting awhile, you may have experienced a very, very difficult door to open. Sometimes I have seen them nearly impossible to open, I could get them about 8 inches open, and then squeeze through. If you have a beer belly, there aint no way. Now most of you know about the big button on the front of an MC12 that you can push and pop the door open from the outside. Most don't know the G45 has a similar deal on it. The first thing you need to do is check that the battery is on. If the battery is off, the door is not going to open anyway. Now, go to the opposite side of the bus from the entrance door, the driver side. Open the service door that is under the drivers window. In the top left of that compartment is a push valve, similar in appearance to a Park Brake push/pull valve. It is Black in color, and is pictured below. Push and hold this valve, you should hear a little air escaping, that air escaping is what is going to allow you to open the door easily. Once the air stops, go pull the entry door open, it should be easier now. and push and hold the black "button" in the top right corner of the compartment. Believe it or not, this seems like it's becoming common. Push The Entrance Door Button and Hear air, door doesn't work. I wish I could explain this one. All I can say is I think it has something to do with the Door Air Manifold. I think something to do with the O-Rings, because it seems to happen more in cold weather. Sometimes it is possible for a mechanic to disconnect one of the air lines, the squirt some lubricant in there, and that patches it up for awhile. I am still searching for a good answer to this, because it sure is annoying. The best an operator could do on the road is Dump the air thru the entry door over rule valve, pull the door closed, and lock the door with the sliding manual lock. and then it won't lock anyway. The G45 entry doors are just junk, and there isn't much most service islands can do about it. A garage should be able to repair most of the issues, like the frame damage. Left Hand (driver side) front service door won't stay closed. This is very common and usually very simple to overcome by anyone. 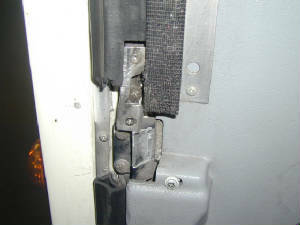 Don't go sticking baggage claim envelopers or duct tape all over the bus. They may not be the best buses in the world, but they do look good. Instead, reach underneath the door, grab the same handle you opened the door with. Now, when you open that service door, you pull the handle toward you. What you need to do to close it properly is, push the door closed and hold it with one hand. With your other hand, reach underneath and push the release handle back. This should close the latches and hold the door shut. This has worked for me most of the time. It's not 100%, but well worth the try. Let us know if this works for you. The door that won't stay shut. The handle that will help close it.